As anyone who’s seen Finding Nemo can confirm, Australia is home to a colourful array of marine life, from crabs, coral and crocodiles to sharks, sea lions and stingrays. So where are the best places to admire the these underwater marvels without getting wet? 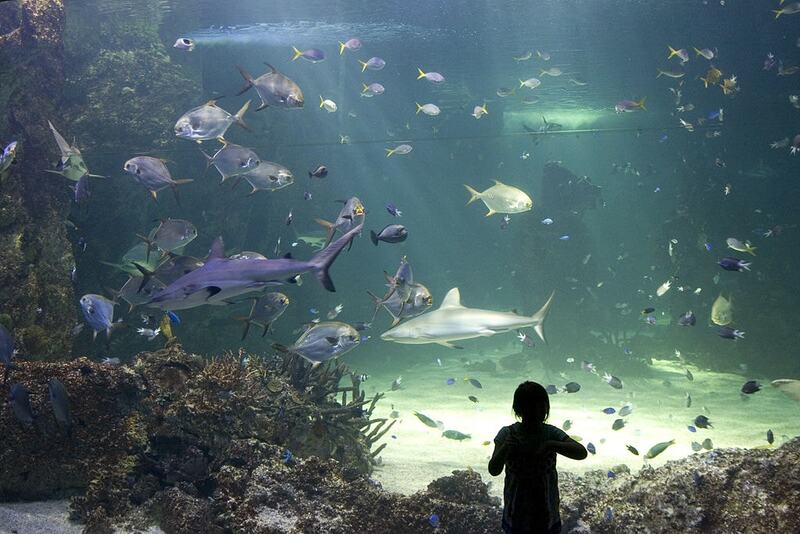 Try these eight aquariums and marine parks around Australia. If you’ve got nerves of steel, then jump into the ‘Cage of Death’. 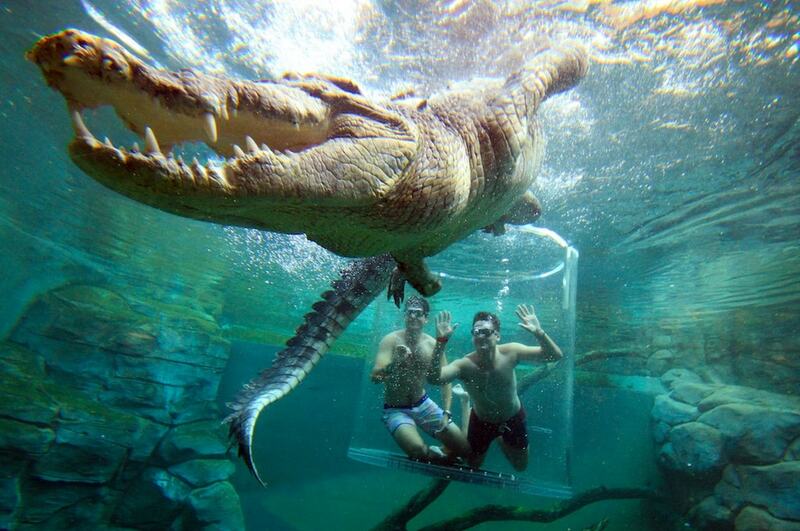 Australia’s only crocodile dive gives you the chance to stare a five-metre saltwater croc in the eye from behind a thin layer of perspex dipped into the crocodile-infested enclosure. Crocosaurus Cove — located in the heart of Darwin, Australia’s tropical capital — also offers less-stressful experiences like holding a baby crocodile, visiting the turtle billabong, or checking out the fish species in the 200,000 litre freshwater aquarium. 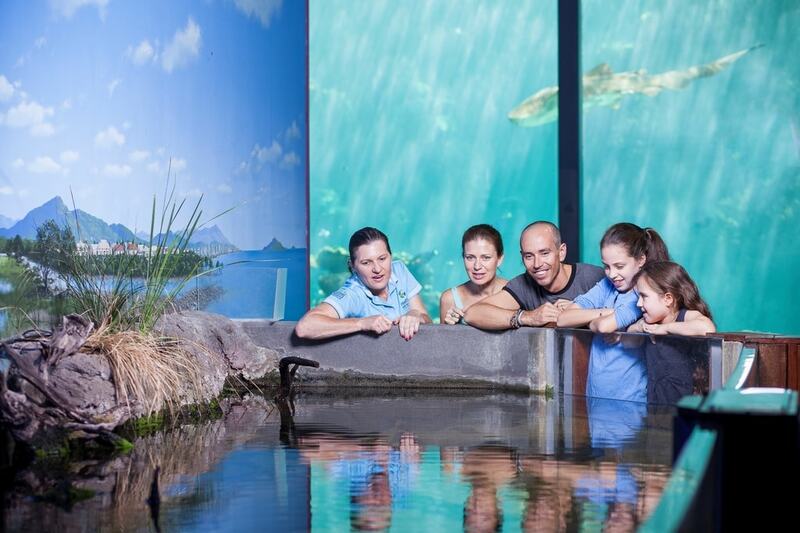 A $20 million renovation of this Darling Harbour aquarium in 2012 divided Australia’s largest collection of aquatic life into 14 new themed zones, taking visitors on a journey through the country’s diverse underwater ecosystems. Sea Life Sydney is home to 700 species of 13,000 individual water creatures, including two of the five dugongs on display anywhere in the world. Not to be outdone, Melbourne’s aquarium enjoyed a $8 million facelift in 2013, which now includes 12 zones of discovery such as the Bay of Rays, home to the world’s only public display of elephant sharks. Sea Life Melbourne offers shark dives, penguin meetings and glass-bottom boat tours of the 2.2 million litre oceanarium smack-bang in the city centre. Welcome to the largest living coral reef aquarium in the world, established in tropical Townsville 30 years ago as the government’s national education centre for the Great Barrier Reef. Experience the wonders of the reef with a 2.5 million litre exhibition containing 130 species of coral as well as thousands of weird and wonderful underwater creatures like worms, snails, sea urchins, sponges and sea cucumbers, plus a turtle hospital. WA’s 20,000 kilometres of coastline is condensed into five zones — Far North, Coral Coast, Shipwreck Coast, Perth and Great Southern — at AQWA, perched on the waterfront at Sorrento Beach in Perth. 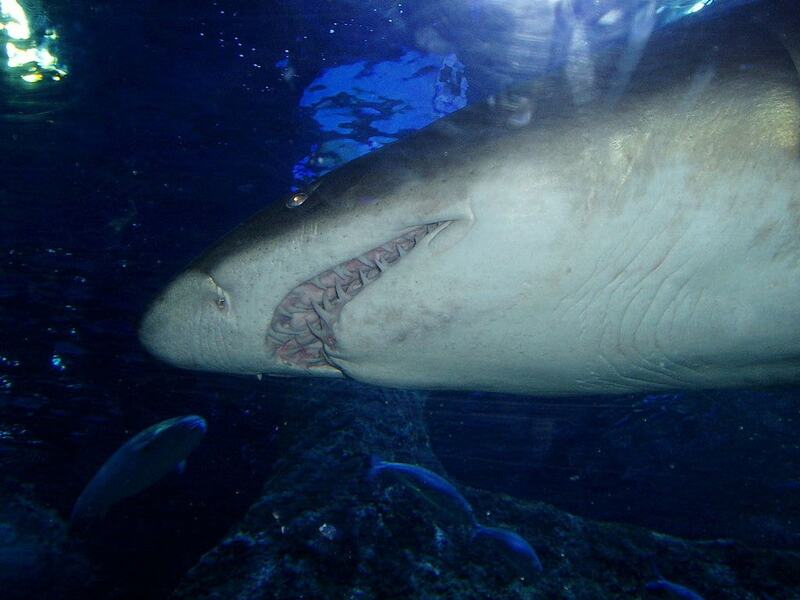 It was Australia’s largest aquarium when it opened in 1988 and still features the country’s biggest single tank — a lazy three million litres — that includes a 98-metre underwater tunnel that allows you to admire grey nurse sharks, smooth stingrays and loggerhead turtles from below. This brand-new $54 million facility has just thrown open its doors in September 2017, bringing the treasures of the reef and the rainforest into the heart of Cairns city. The sparkly new aquarium houses 15,000 aquatic organisms across 71 live exhibits that capture the colour and diversity of Tropical North Queensland, a region that’s straddled by two World Heritage listed natural environments: the Great Barrier Reef and the Daintree Rainforest. The Gold Coast is Australia’s theme park capital — crowds flock to Warner Bros. Movie World, Wet ’n’ Wild, Dreamworld and WhiteWater World — but Sea World has been a favourite with families for almost four decades. 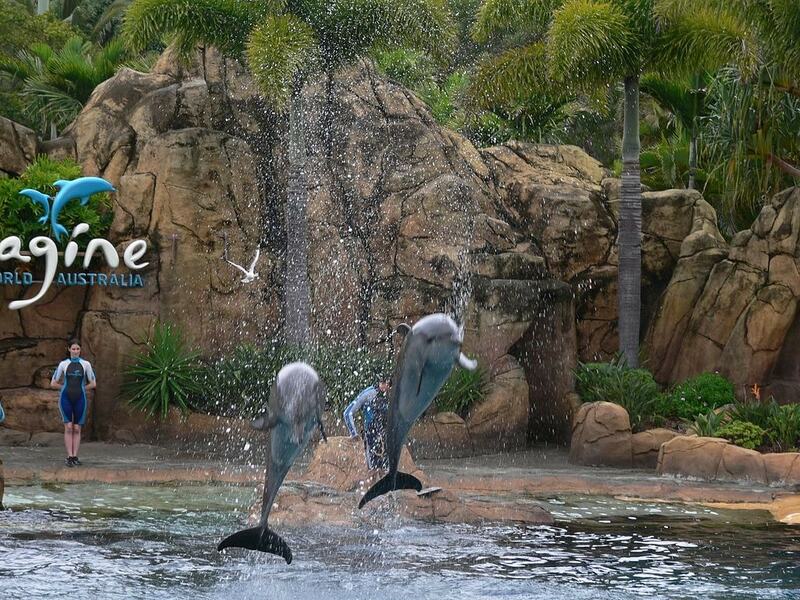 There are thrill rides and live kids entertainment but the dolphins are the stars of the show, with a number of up-close-and-personal experiences available to book. Encounters with sharks, seals, penguins and polar bears are also on offer. This green shed on Tasmania’s north-west coast was originally built to process crayfish, but is now home to some of Tassie’s most remarkable sea life. We’re talking Tasmanian giant crabs that grow to a size of 16 kilometres, six-foot long conger eels, playful striped trumpeter fish and female octopi hatching their eggs. The gift shop also stocks local crayfish, abalone, crab, salmon and pickled octopus if the irony of tucking into seafood after visiting an aquarium isn’t too much.